Surgical Instrument Cleaners cleaning Surgical Instruments cleaner effectively. The ONEcleaner Medical Surgical Instrument Cleaning Detergents are designed for cleaning surgical instruments residue free. The ONEcleaner Washer Disinfector Detergent Enzyme Lubricant Cleaners will cut your costs for reprocessing surgical instrument, devices, and utensils. Your first-line-of-defense against Corrosion is proper cleaning. The ONEcleaner Surgical Instrument Cleaners strengthen the protective passive oxide layer of surgical instrument stainless steel. Corrosion resistant does not mean corrosion proof. One of the special characteristics of these steels is that the manufacturer forms a passive oxide layer on the surface, which protects them against corrosion. This makes surgical instruments as corrosion resistant as possible. It is imperative that you maintain the passive oxide layer to prevent corrosion and maintain your surgery instruments in optimal condition. If this is not done, the stainless steel will corrode or stain more readily. This will reduce the life of the surgical instruments or render them useless. Initially, all stainless steel surgical instruments have the same passive layer corrosion resistance. Manufacturers of surgical instruments recommend the use of neutral pH cleaning concentrates. The ONEcleaners have been shown to be effective in optimizing the corrosion protective passive oxide layer. This will provide a longer life for stainless steel surgical instruments. Virtually all manufacturers of stainless steel surgical instruments, rigid scopes, and flexible scopes recommend the use of neutral pH cleaning concentrates to build and strengthen the protective passive layer of surgical stainless steel. Do not use high acidic (pH <4) or high alkaline (pH >10) products for disinfection or cleaning, since these can corrode metal, cause discoloration or stress fractures. Never use bleach to clean any surgical instruments. The high pH of bleach causes surface deposits of brown stains and might even corrode the instrument. Even high quality stainless steel is not impervious to an acidic bleach solution. Sort instruments by similar metal for subsequent processing so that electrolytic deposition (galvanic corrosion) due to contact between dissimilar metals will not occur. Tap water can contain many minerals, which may discolor and stain surgical instruments. It is recommended that de-ionized water be used for the final rinsing to prevent spotting. The ONEcleaner all-in-ONE combination cleaning concentrates can be effective in treating unacceptably hard source water and removing hard water encrustation from surgical instruments and equipment. Clean instruments, or apply an enzyme detergent soaking solution treatment to prevent the drying and encrustation of debris, as quickly as possible after use. Do not allow blood and debris to dry on the instruments. If cleaning must be delayed, place groups of identical metal instruments in a covered container with appropriate detergent or enzymatic solution to delay drying. The use of soaking enzyme foam sprays has been shown to reduce the time for manual cleaning and render higher quality outcomes. The ONEcleaner dilution rate is .25 to .5 ounces per gallon. (1.92 ML per Liter to 3.85 ML per Liter). Apply it ONCE. It's all you need for cleaning surgical instruments fast and effectively. The all-in-ONE cleaners are surfactant based for cleaning proteinaceous soil and removing stains from surgical instruments. 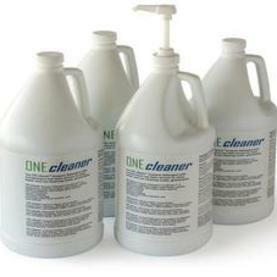 The ONEcleaner Surgical Instrument Cleaning Detergents deliver a unique formulation of enzymes, detergents, and surface lubricants to rapidly breakdown and remove bioburden, clean the surface of surgical stainless steel, prevent corrosion, remove stains, enhance the surface protective passive layer and lubricate the moving parts of surgical instruments.